WakeupData awarded third place for the FDIH Best E-commerce Tool 2018! Last week was the annual FDIH E-commerce Awards in Copenhagen. 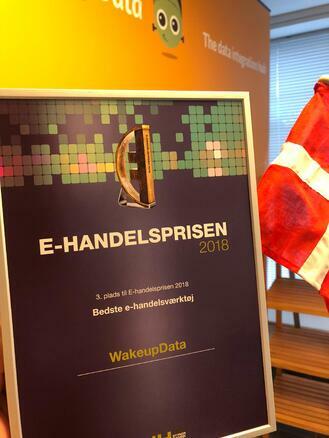 For the second year running we received an award, this time in the Best E-Commerce Tool category which saw WakeupData represented on the night by Kasper and Victor. Last year we received the second place in the 'Best e-commerce solution' category for our work with Kaufmann, which you can read about here. As the last category of the evening this year, there was a nerve-racking wait but we were very happy to be recognised in our third place position as the Best E-commerce tool 2018. Agillic were awarded first place whilst Raptor achieved second, and we offer both our warmest congratulations. "It means a lot for us to receive this award as one of the best E-commerce tools in Denmark. We have made improvements across the board in the past year so it's nice to have recognition of this." We are looking forward to the year ahead and are hoping for another successful nomination next year.